Safety A Primary Cowboys Draft Target? 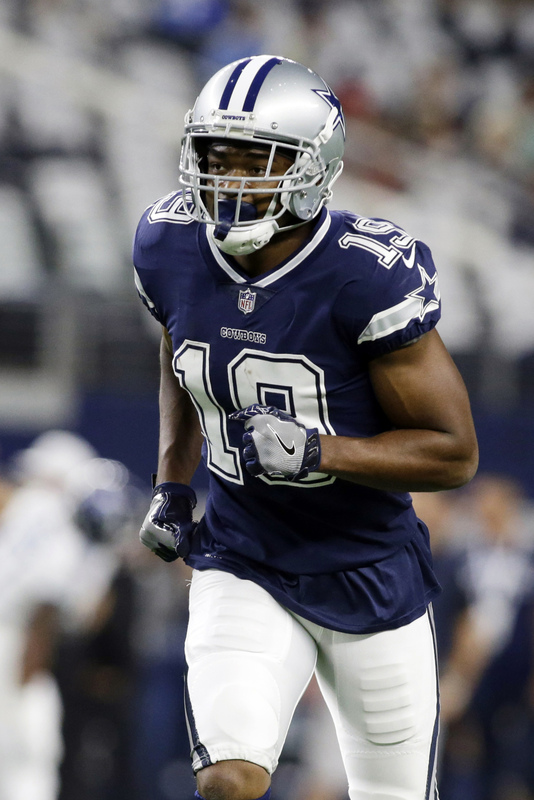 Because of their Amari Cooper trade, the Cowboys do not have a first-round pick. Their first draft window will not open until pick No. 58. It appears the franchise is content with this arrangement. The Cowboys are unlikely to trade into the first round and are not expected to move up too far in the second, executive VP Stephen Jones said, pointing to the potential cost of a future first-round pick in order to move into this year’s first round. “I don’t think so,” Jones said, via Clarence Hill of the Fort Worth Star-Telegram, on the subject of trading into Round 1. “It took an act of Congress to give up a first-round pick (for Cooper). We know how valuable those are. It took a lot of discussion, a lot of homework, a lot of really getting your hands around giving up a first round pick, and certainly, it’s something that you don’t love to do without. Cooper cost the Cowboys what turned out to be the No. 27 overall pick. Dallas’ late-season success, though, made Oakland’s selection worse than many envisioned when the October deal was made. 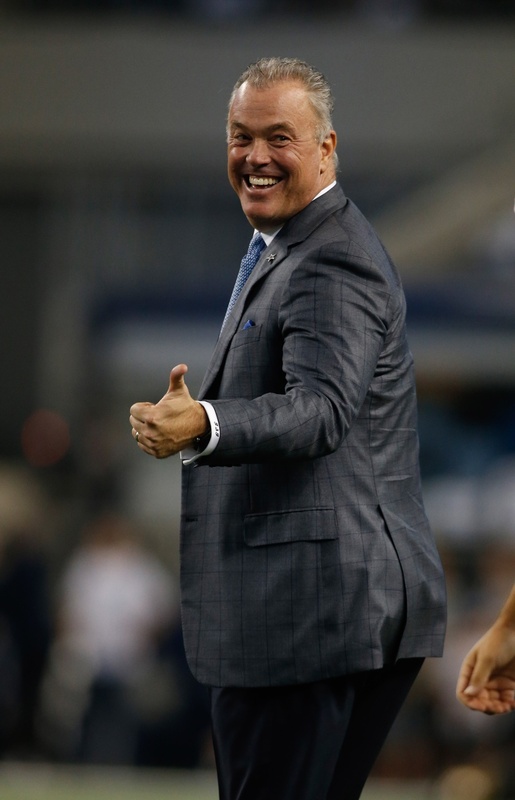 The Cowboys have since started extension talks with their new No. 1 wide receiver, who has beaten Ezekiel Elliott to the bargaining table. This draft will be the first since 2009 that does not feature a Cowboys first-round pick. The team’s list of visits did not include many players who are expected to be first-round choices, though safety Johnathan Abram visited Dallas. In one of the least dramatic decisions in the history of the fifth-year option, the Cowboys will exercise Ezekiel Elliott‘s. Stephen Jones confirmed Wednesday (via Jon Machota of the Dallas Morning News, on Twitter) the team will pick up the Pro Bowl running back’s 2020 option. Selected with the 2016 No. 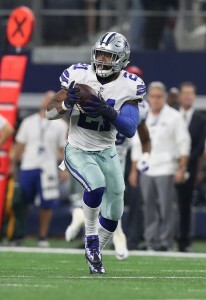 4 overall pick, Elliott quickly became one of the league’s best backs. He has emerged as an impact player in Dallas, continuing the franchise’s storied running back history. This option will mean a $9.09MM 2020 salary for the Ohio State product, though negotiations for a new contract in the meantime figure to begin fairly soon. However, the Cowboys and Elliott have not started extension talks, Todd Archer of ESPN.com reports (on Twitter). Elliott reported for the start of the Cowboys’ offseason program this week, despite being viewed as a holdout risk. But now that he is extension-eligible, this situation is one to monitor this offseason. Both Todd Gurley and David Johnson signed extensions before the start of their fourth seasons, and Elliott — who joins them in having an All-Pro nod on his resume — will stand to want a similar contract. Despite Gurley being named All-Pro last season, Elliott finished with a career-high 2,001 yards from scrimmage and needed only 15 games to get there. The Cowboys gave him 381 touches, far more than the 354 he amassed during the 2016 season in which he won the rushing title. He has already accumulated 1,003 touches — far more than Gurley or Johnson when they signed their second contracts — so this summer could be important in securing his landmark deal, before the Cowboys attempt to tack on another 350-plus touches to his odometer. Dallas appears to be putting new deals for Dak Prescott and Amari Cooper on the front-burner, however. While Elliott, Jones and Smith would certainly qualify as other players on Dallas’ roster that factor into the franchise’s long-term plans, talks beginning with Prescott and Cooper represent a key step this offseason. Both players are entering contract years. Each will likely be a key Cowboys cog into the 2020s. The Cowboys’ most recent stance on Prescott was a wait-until-Russell Wilson-signs mindset. With Wilson having signed his record $35MM-AAV extension on Tuesday, it would appear time for Dallas to advance in talks with its multidimensional quarterback. This could be a similar approach to the Lawrence negotiations, with the organization — though obviously high on its three-year starting passer — potentially eyeing a deal that will come in under Seattle’s Wilson pact. Prescott is five years younger than Wilson but obviously has not proven what the Seahawks veteran has, making this a dynamic similar to the Cowboys trying to bridge a gap for Lawrence between the Khalil Mack and Von Miller prices. The Cowboys also have leverage on Prescott, similar to what the Seahawks possessed with Wilson in 2015, with another year of a mid-round rookie salary on tap in 2019. While reiterating a view Prescott’s next deal cannot put the Cowboys at a financial disadvantage, Jones pointed to Wilson and fellow $33MM-plus-AAV passer Aaron Rodgers having won a Super Bowl. This lends further credence the Cowboys are not planning to make Prescott the new highest-paid NFLer. “You’re talking about two guys there who, between Rodgers and Russell Wilson, have won Super Bowls that have had success year-in and year-out taking their teams to the playoffs,” Jones said. “So, yeah, those are guys who are going to make those type of (salary) jumps. But I’m not concerned. 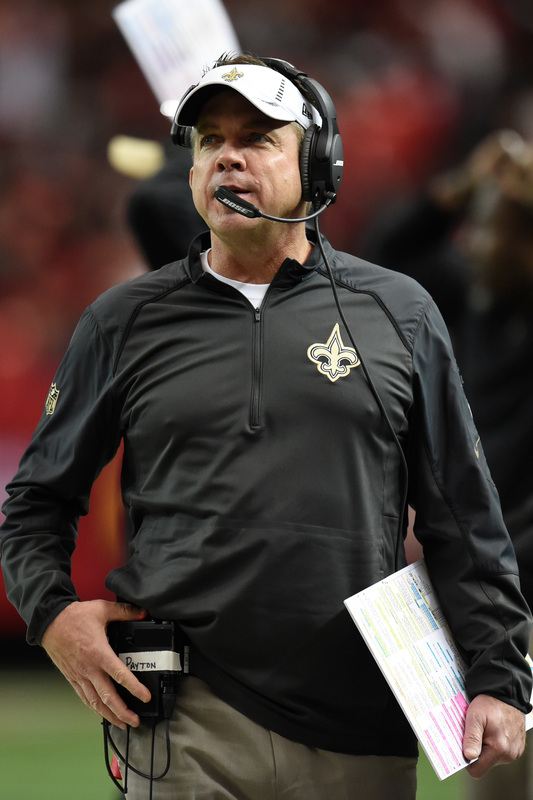 I think at the end of the day if there’s any position that has to keep an eye out, not only for the themselves, but they have to keep an eye out on their team in terms of how much cap space they take up, these quarterbacks are those guys because, at the end of the day, they’re going to make a lot of money. Cooper is entering his fifth-year option season. He is set to make $13.924MM in 2019. The Cowboys have been eyeing an extension for their 2018 trade acquisition since trading for him, so it is not surprising to see him join Prescott early in the team’s 2019 re-up queue. 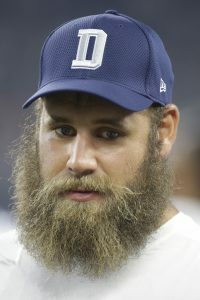 Travis Frederick was on hand for the start of the Cowboys’ offseason program this week, a major step forward for the All-Pro center. Frederick missed the entire 2018 season as he battled Guillain-Barré Syndrome, but he appears to be on track to play in 2019. The voluntary April program focuses on conditioning, which should give the 28-year-old an opportunity to get back into shape. Then, in May, he’ll partake in on-field work during OTAs. Before the illness, Frederick started 80 straight games for the Cowboys. He had another productive season in 2017, as Pro Football Focus ranked him third among eligible centers. Should he suffer another setback, the Cowboys could once again call on Joe Looney, who is set to earn a base salary of just $1MM in 2019. Cowboys offensive tackle La’el Collins underwent surgery this offseason to repair a torn rotator cuff, reports Clarence E. Hill Jr. of the Fort Worth Star-Telegram. The team is expected “to be cautious” with Collins through OTAs and minicamp, but he’s expected to be healthy for training camp in July. The lineman joins a growing list of notable Cowboys players who underwent offseason surgery. After inking a lucrative new deal with the team, Demarcus Lawrence underwent surgery on a torn labrum. While the pass-rusher is focused on being ready for the start of the regular season, Hill cautions that the four-to-six month recovery time means he may not be back until October. Starting cornerback Byron Jones also underwent hip surgery back in March. He’s expected to start training camp on the physically unable to perform list. 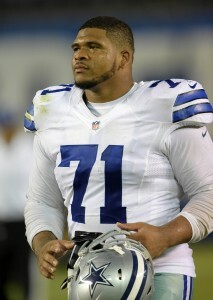 Collins joined the Cowboys as an undrafted free agent back in 2015, and he’s emerged as a key piece on the team’s offensive line. He started all 32 regular season games over the past two seasons, including a 2018 campaign where he ranked 31st among 80 eligible offensive tackles (per Pro Football Focus). The 25-year-old is heading into the final year of his contract.